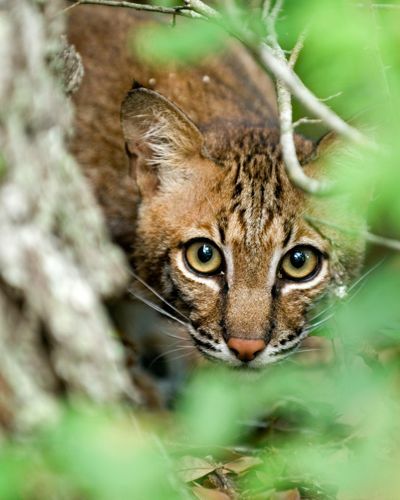 A photo of a young bobcat peering through the foliage at San Bernard National Wildlife Refuge in Texas has received top honors in the Refuge Photography Contest, which seeks to raise the visibility of the National Wildlife Refuge System, the world’s largest wildlife conservation program. Taken by Keith Ramos of Galena, Alaska, the photo captures a curious bobcat just released into the wild by a wildlife rehabilitator. Ramos, who serves as Deputy Manager of the U.S. Fish and Wildlife Service’s Koyukuk/Nowitna National Wildlife Refuge Complex, took the photo when stationed at San Bernard. For his winning photo, Ramos will receive the Southwest Airlines Adventure Package that includes $2,000 and four round trip tickets, valued at $3,600. Second place: Carol Grant of Clearwater, FL, for her photo of two manatees at the Crystal River National Wildlife Refuge (NWR), FL. Third-place: Les Zigurski of Scales Mound, IL, for his photo of two bald eagles in the midst of an aerial conflict at the Upper Mississippi National Wildlife and Fish Refuge, IL. Fourth-place: Betsy Kellenberger of Tallahassee, FL, for an image of a yellow warbler perched among late-summer flowers taken at Florida’s St. Marks NWR in the Crawfordville, FL area. A complete list of prizewinners in this year’s contest and more than 150 images selected for the Finalists Gallery can be found at NWRA’s 2012 photo contest homepage. The contest would not be possible without the tremendous generosity of our sponsors: Southwest Airlines, Eagle Optics, Wild Bird Centers, Orvis, NatureShare and Zenfolio. Should you have any questions, please contact Maggie at mthomas@refugeassociation.org.